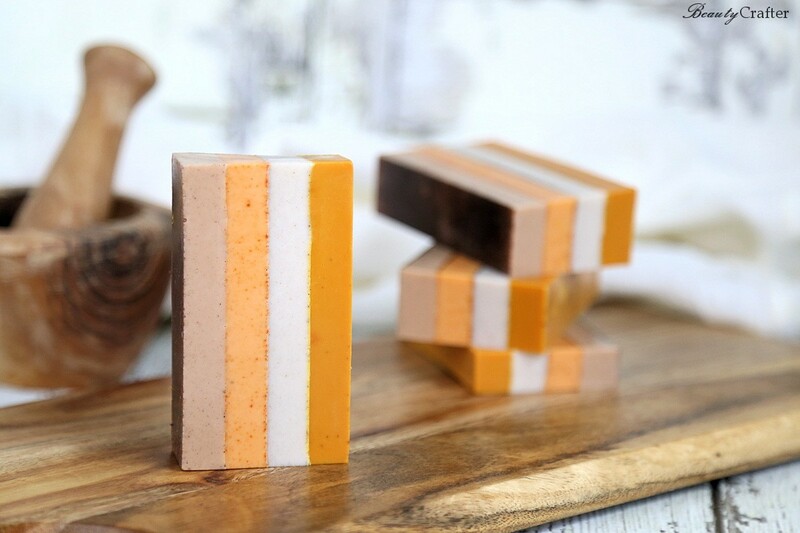 This easy melt and pour striped spice soap recipe is colored with kitchen spices that create rustic fall colors. I think the natural variation in the coloration in each stripe of the soap really adds to the overall look of the soap and goes great with the Harvest Spice fragrance oil I chose for it. It makes the simple melt and pour soap look more handmade than commercial colorants (soap pigments can be pricey for those who only want to do an occasional soapmaking craft). Hand cutting the bars also adds to the handcrafted appearance. 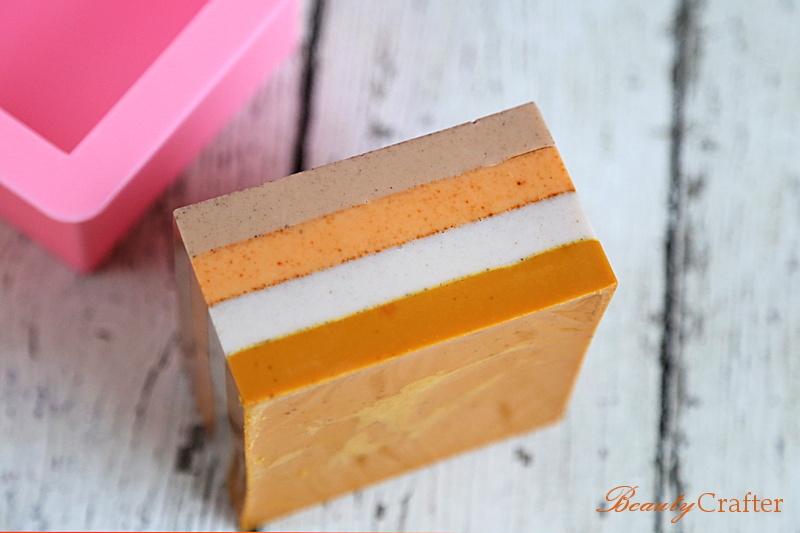 Making these striped spice soap bars colored with kitchen spices is easy, just weigh and melt each layer of melt and pour soap then color and scent. Patiently waiting for each layer to be semi-firm will be the only hard part. Start with a nice rich melt and pour white soap base. I suggest one with Goat’s milk or shea butter. I found a square silicone loaf mold that holds one pound of soap with ease. It can actually fit up to 18-19 ounces, but is still far more manageable than the 42 to 48 ounce size of most molds. It makes 4-5 nice full sized bars of handmade soap. Usable for both melt and pour as well as cold process soaps. 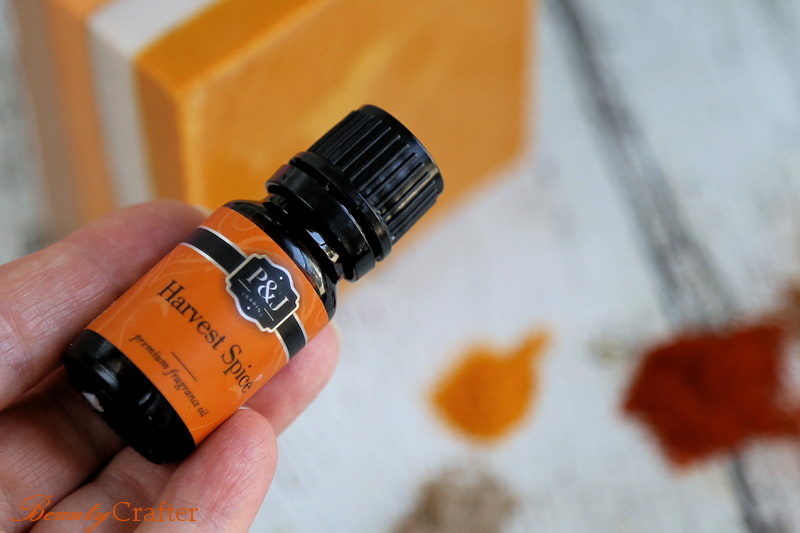 The Harvest Spice fragrance oil I selected for the spice soap recipe came out of the set below. I have been using the different oils in a number of fall projects on this site. They are also nice for candles and diffusing. The scent is available as a single oil also. … and no the spices coloring the soap will not provide enough fragrance alone. 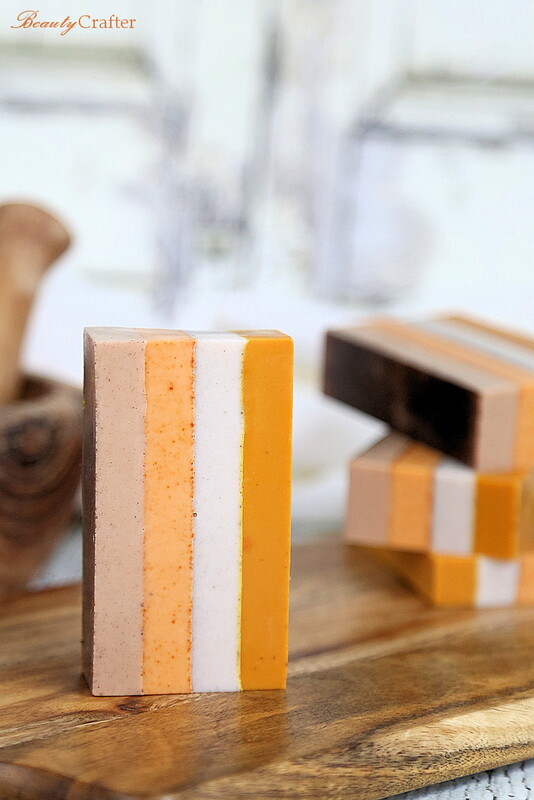 A lovely striped melt and pour soap colored with kitchen spices. Cut up soap into small chunks and divide into 4 ounce portions. Place one 4 oz portion of chopped soap into a microwave safe bowl or glass measuring cup, then microwave until melted (30 seconds maybe a little more). Stir in spice for the layer (start with layer 1) until well mixed, allow to slightly cool but not enough to start solidifying, then add the fragrance oil and mix again. Gently pour into mold, avoiding spilling on sides. Allow to cool until a thick skin has developed before pouring next layer. After all four layers are poured and soap has fully cooled and firm. Slice into 4-5 bars. Store in airtight container or shrinkwrap bags .